Whip up a drawstring backpack for school, a trip to the library or simply a tote for carrying all the necessities while out on errands. This backpack pattern features a lining, large outside pocket and external tabs on the bottom corners for attaching the drawstring. This sewing pattern is very simple and would be a great parent/child project in preparation for back-to-school. This backpack is sewn using 1/4-inch seam allowances throughout. 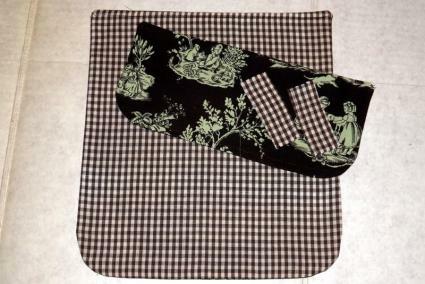 The amount of cut yardage is noted but the backpack can also be made using scraps of fabric left over from previous projects. Download and print the pattern above. 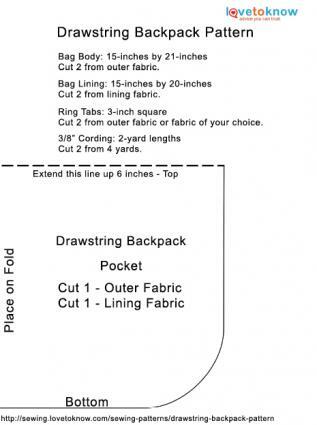 Cut backpack pieces using the measurements and patterns given on the printable. If you need additional help downloading the PDF pattern, try these tips. Place the pocket and the pocket lining together with the wrong sides facing out and pin. Sew around all sides, leaving a 3-inch opening in the center of the bottom edge. Turn the pocket right side out through the opening and press. Lay one bag piece on your work surface with the right side facing up. If your bag pieces were not cut from the same fabric, choose the one you want for the front. Place the pocket on the bag front 2 inches above the bottom edge and centered between the side edges. Pin the pocket to the bag front. Sew a scant 1/4 inch top stitch along the sides and bottom of the pocket to secure. Top stitch again as close to the edge as possible. Place the pocket flap and pocket flap lining together with the wrong sides facing out and pin. Sew around the edges, leaving a 3-inch opening in the center of the top edge. Turn the flap right side out and press. Sew a double top stitch along the sides and bottom of the flap in the same way as the pocket. Lay the flap over the pocket, positioning the top edge of the flap 2 inches above the top edge of the pocket. Pin the top edge of the flap. Sew a double top stitch along the top edge of the flap to secure. Line the pocket and pocket flap. Fold a tab square in half with the wrong sides facing out. 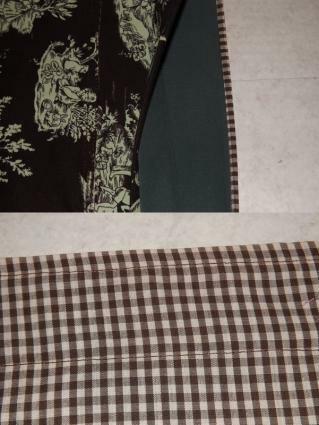 Sew a 1/4-inch seam allowance along the long edge. Repeat with the other tab square. Turn the tabs right side out and press. Thread a 1 1/4-inch split-ring key ring on each tab. Fold one tab in half with the short ends matching. Pin the short ends 1 inch above the bottom of the bag front, on a side edge. Repeat with the other tab on the other side edge. Place the front and back pieces of the bag together with the wrong sides facing out and pin the sides and the bottom. Make a mark 1 inch and 2 1/2 inches below the top on each side edge. This will leave a 1 1/2-inch space between the marks. 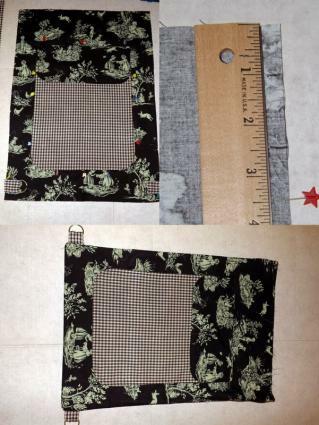 Using a 1/4-inch seam allowance, sew the sides and bottom edges of the bag, skipping over the marked 1 1/2-inch spaces. Press the seams of the 1 1/2-inch spaces open. Top stitch around the openings. Pin the tabs and mark the sides for casing. Place the bag lining pieces together with the wrong sides facing out and pin the sides and bottom edges. Sew the pinned edges, leaving a four-inch opening in the center of the bottom edge. Turn the backpack bag right side out and insert it in the wrong-side-out lining. Line up the top edges and pin. Sew around the pinned edge. Turn the bag right side out through the opening in the lining. Hand sew the opening in the lining closed. Insert the attached lining into the bag. Fit the corners inside of each other. This will cause the outside of the bag to fold slightly inside the top edge. Press the top edge. Sew a 1/4-inch top stitch around the top edge, and again at 1 1/4 inches from the top edge. This is your drawstring casing. Attach a 3/4-inch magnetic purse clasp to the pocket. Pull the two halves apart, center the back piece 1/2 inch below the top edge of the pocket and attach to the outside using the package instructions for the clasp. Drop the flap over the pocket opening and line up where the other half of the clasp will go. Attach the remaining half to the back of the flap. The back of the second half of the clasp is visible on the front of the pocket flap. Hand sew a running stitch around the edge of the fabric yoyo circle. Pull the thread to gather the circle into a pouch. Flatten the pouch with the gathered opening centered on top. Place a 5/8-inch flat button over the gathers and attach. Apply craft glue to the back of the yoyo and place it over the back of the clasp that is showing on the flap. Allow the glue to dry. Cut two, 2-yard lengths of 3/8-inch cording. Tie one end of one cording length to a large safety pin. Insert the pin through the left casing opening, around the bag and back out the same opening. Pull the end down and insert through the key ring on the left bottom corner of the bag. Remove the safety pin. Bring the ends of the cord together and tie an overhand knot 2 inches from the ends. Repeat with the remaining cording length on the right side of the bag. Attach the drawstrings to the rings. To avoid confusion with the instructions and the photos, here is a run down of each of the fabrics and where they were used. You can certainly tweak this pattern to fit your needs. Alterations in the size, construction, and supplies used are easy fixes. When altering the size, the lining should still be one inch shorter than the bag, the pocket flap should still be the same width as the pocket and provide spacing between the top, bottom and sides of the bag for the new pocket size. The drawstring cords can be adjusted to fit while being worn. For quicker construction, consider eliminating the pocket and flap. No key rings available? Dig through your craft stash or junk drawer for alternatives. Old jewelry, washers or shower curtain rings would be suitable and fun substitutions. Cut your pieces from old clothing for a custom backpack with a story. 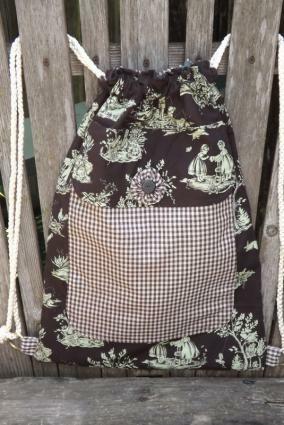 You'll love the adorable drawstring backpack at Sweet Bee Buzzings. She used twill tape for her drawstrings, with additional recommendations for other drawstring ideas. This bag would be perfect for a small child to carry and the wonderfully explained instructions will allow the most novice of sewers to achieve success. Instructables has a great drawstring backpack tutorial using a t-shirt. This is a no-cost bag as all the pieces are recycled bits of the t-shirt. This is a super easy project which would be a fantastic group activity for a teen's sleepover. Yes, the shape of a drawstring bag hanging down your back does resemble a pineapple, so why not give it all the characteristics of the fruit? Make It and Love It did just that and it is so cute. Your child will love filling it with all the essentials for a trip to the pool. While the instructions are fabulous for this backpack, intermediate sewing experience would be helpful. ikat bag has a really cool idea for fall birthday party favor bags. She made drawstring backpacks that look like candy corn for each lucky party guest to take home. The candy corn stripes were made using fleece. This is an easy tutorial. 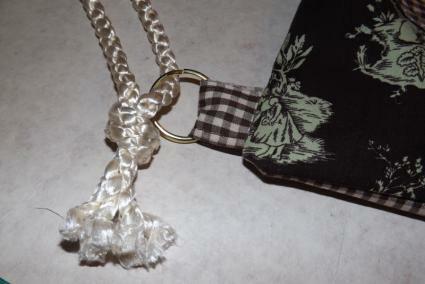 Drawstring bags are an excellent scrap busting idea. They can be made as big or as little as you desire and are an eco-friendly way to wrap gifts for gift-giving celebrations.